The personal injury team at Tait & Hall is dedicated to obtaining justice on behalf of anyone who has suffered a personal injury. Our premier team of Arizona personal injury attorneys tackles a variety of personal injury and wrongful death cases including car accidents, bicycle accidents, premises liability, product liability, nursing home negligence, dog bites, at-work injuries and more. We only represent individuals, not corporations or big insurance companies and we give each of our clients personal care and attention every step of the way, fighting for and securing the settlements they deserve. We are pleased to further serve our personal injury clients by charging by contingency fee only – this means that our representation costs you nothing unless we win your case – and we plan to. 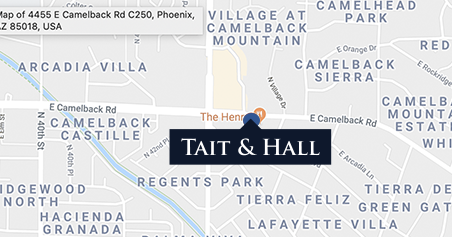 Call to set up a free consultation and let the Arizona personal injury lawyers at Tait & Hall start fighting for you today.